See your supplies from all four sides with unbreakable clear bins stacked on open wire shelving. Nine configurations available. Each includes a shelving unit and the size and number of Clear-View Ultra Stack and Hang Bins listed in the below table. Capacity: 600 lbs. per shelf. Easy access, high visibility and air flow on all sides. Optional Mobile Kit and Donut Bumper also available. Please see Options tab for details. Optional Clear Label Holders with Laser Label Inserts, Bin Dividers and Bin Windows also available. Please see Options tab for details. Guaranteed not to break or crack under normal load conditions. Heavy-duty, injection-molded tri-clear polypropylene bins. Easy handling with front, back and side grips. Attaches to louvered panels or rails with the built-in rear hanger. Maximizes flexibility and keeps contents from spilling over with optional Dividers. 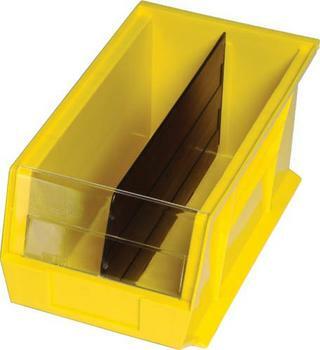 Keeps stacked bins steady and prevents forward shifting with a wide stacking ledge and anti-slide lock. Waterproof and impervious to most chemicals. Large molded front label slots for ID labels. 12 - QUS240CL 10-7/8" x 5-1/2" x 5"
Optional Bin Dividers for Quantum QUS Series standard, Clear-View, Recycled and Pink Ultra Stack and Hang Bins. NOTE: Models starting with CRDUS238 are cross dividers. All other models fit lengthwise, as shown. The following models (including corresponding Clear-View and Recycled) have three Divider Slots: QUS235, QUS245, QUS250, QUS255, QUS260, QUS270, QUS275MOB. All other models have one Divider Slot. Increase bin capacity without sacrificing content visibility. Compatible with all QUS Series Ultra Stack and Hang Bins including Clear-View, Recycled and Pink. Helps maximize storage space and prevent spillage. Clear injection-molded crystal styrene window front. NOTE: Clear Bin Windows are not available for models QUS200, QUS210 and QUS220.